Grammy Award-winning Producer, Hall of Fame Songwriter, recording artist, and TV star Jermaine Dupri, has been an iconic presence in the music industry for 25 years. Celebrating his legacy and So So Def’s quarter century of success, Jermaine is bringing all his artists together on one stage. Joining Jermaine will be the So So Def Family, including Xscape, Da Brat, Jagged Edge, Bow Wow, Bone Crusher, Youngbloodz, Dem Franchize Boyz, Anthony Hamilton and J-Kwon. Tickets for the show at Atlanta’s All New State Farm Arena on Sunday, Oct. 21st are available at ticketmaster.com. This will be the first show in the venue after the completion of its $192.5 million transformation. 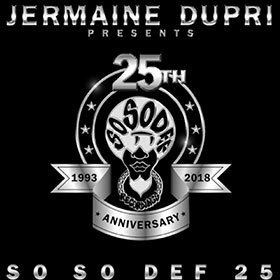 To kick the Anniversary off, Sony Music’s Certified Classics, Legacy Recording’s division for the celebration of Sony Music’s Hip Hop and R&B catalogue, recently released the essential digital hits compilation, titled Jermaine Dupri Presents So So Def 25. The compilation includes So So Def classics such as Da Brat’s “Funkdafied”, Xscape’s “Just Kickin’ It”, Dupri’s own “Money Aint A Thang (feat. Jay-Z)” and many more plus rare tracks featuring Kanye West and The Notorious B.I.G.. The compilation, curated by Dupri to align with the tour, further celebrates Jermaine Dupri and the iconic Atlanta-based hip-hop label So So Def. You can purchase the compilation here.